For our third post for math skills, we were assigned to explain if 2/5 of 3/4 are the same as 3/4 of 2/3. 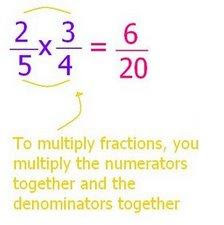 To find out, I am going to use pictures and multiplication. As you can see, 2/5 of 3/4 and 3/4 of 2/5 are the same. They both are equivalent to 6/20.